The hardware you choose for your door should pair smart functionality with stylish design. 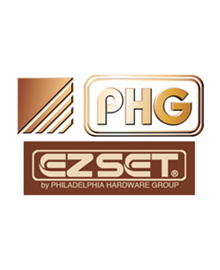 Use this buying guide to find the best hardware for all of your exterior and interior doors. The vast array of door hardware choices can seem overwhelming, but if you keep in mind what the hardware will be used for, you can more quickly sort through the options. Some hardware is designed for exterior doors, while other products are meant for interior doors. Some types feature a locking mechanism, while others do not. 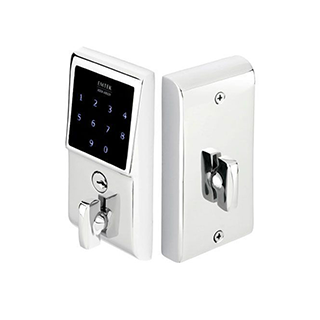 Some hardwares designed to provide extra security, while other types of hardware are not functional at all they’re purely designed for aesthetic purposes. Here are the main types of door hardware available. Designed for entry doors, this type of hardware includes a key-operated lock and a deadbolt within a rectangular metal box. 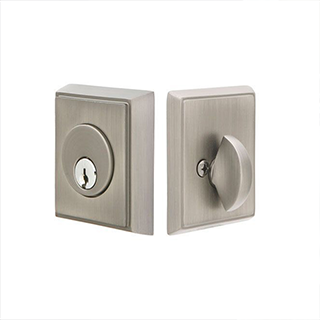 These lock sets, available in both knob and lever designs, feature a key-operated lock and are designed for exterior doors. They are often paired with a deadbolt for extra security. 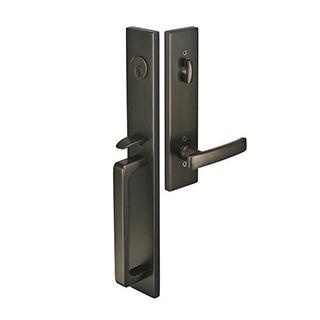 This hardware features a flat-ended bolt that extends into the door frame for added security. Single-cylinder deadbolts with a thumb-turn latch on the inside are the most popular, but double-cylinder deadbolts are also available. Double-cylinder models must be locked and unlocked from both sides with a key. Most external doors are pre-drilled for deadbolts, making installation easy. This type of door hardware allows users to type in a code to open the door instead of using a key. They can be a good option for large families or for people who tend to lose their keys. For advanced home security and convenience. Audio and visual indicators confirm the lockset is activated. Some models will sound an alarm after the incorrect code has been entered more than three consecutive times. Anti-theft rolling code feature ensures the same code is never used twice. Some systems are compatible with some garage door openers so the homeowner only need one remote. 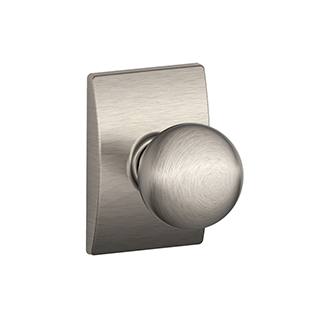 Used on interior doors where privacy is not a concern, these knobs do not include a locking function. An interior lockset used inside the home in hallways or closets between rooms where privacy is not important. Has to, non locking knobs, one on each side of the door. Some models use levers instead of knobs. Available in a wide variety of styles and finishes. These knob or lever latch sets include a locking mechanism. They are typically used for bedroom and bathroom doors. Designed for privacy rather then for security. Has a locking button on the inside knob but no key device on the outside knob. Can be either a knob or a lever. In an emergency, the lock can be opened from the outside by inserting a narrow object through the small hole in the outside knob and either depressing or turning the locking mechanism inside, depending on the type of lock. Available in a wide variety of style and finishes. Used on both interior and exterior doors, this type of hardware is not connected to a latch or locking mechanism. It is used for aesthetic reasons, such as to provide matching trim on the non functional unit in a set of French doors. Used only for decoration or applications that do not need a latch. Has no latching mechanism and does not turn. 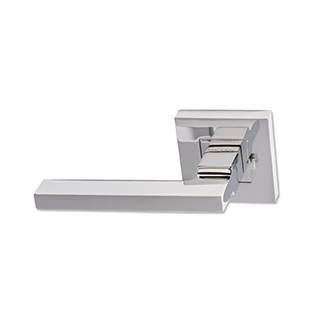 When comparing the various hardware options, you’ll want to consider both style and function. As you look at the variety of designs and finishes available, think about the style of your home and your specific design tastes to find a good match. Also think about how much security you need as you compare the various options. You’ll want to consider the design of the door where you’ll be installing the hardware, and take some measurements before shopping. If you know a few basic things about your door, you can ensure the door hardware will not only look good but function properly as well. Before purchasing hardware, you’ll need to make sure it will work on your door. If you’ll be using the hardware on an existing door or a door with predrilled holes, you’ll need to measure the diameter of the holes and make sure the hardware trim will cover the openings. Also measure the backset—the distance from the door edge to the center of the hole and the width of the door stile, which is the vertical panel at the edge of a frame-and-panel door, where the door hardware is installed. If the door has a thin stile, you may not be able to install certain hardware sets—of you’ll end up with scraped knuckles when opening the door. Also be aware of the door’s thickness. A standard interior door is 1-3/8 inches thick and an exterior door is 1-3/4 inches thick; if your door’s thickness differs from these standards, you may need to purchase conversion parts to ensure the hardware will work with your door. If you’re purchasing a lockset with a lever handle, you’ll need to know the direction your door swings (called the door handing or hand-of-door) so you don’t end up with levers that are upside down or on the wrong side of the door. Door hardware and locks are available in a variety of styles and finishes, so you can choose a model that complements your home’s style as well as the finishes on other hardware and light fixtures. When choosing a finish, keep in mind that oil-rubbed bronze and antique bronze are living finishes that will change over time. Polished brass will tarnish if used outside, so choose a PVD finish for exterior doors. Also be aware that various brands use the same names for finishes, but they may not be an exact color match; be sure to compare colors if you’ll be using multiple brands. If you want to upgrade the look of your home’s entry (or interior spaces), consider installing a handle set rather than a standard knob or lever. 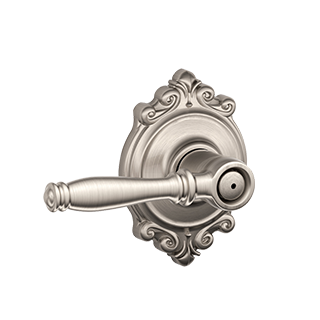 Handle sets provide an upscale look and are available in a range of finishes and with many different trim options. As you’re choosing the hardware for an exterior door, consider how much security you need or want. 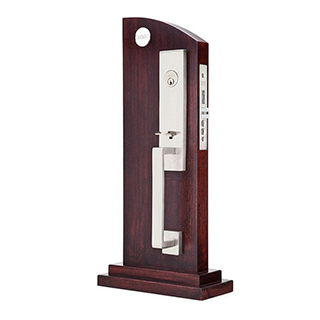 Mortise locks are usually the most secure, so they may provide greater peace of mind. If you have a glass entry door, some people like to install a double-cylinder deadbolt; with this setup, an intruder can’t unlock the door from the inside even if they break the glass. However, you’ll only want to use a double-cylinder lock if you have another easily accessible fire exit, because you would need to search for the key before being able to escape the house in an emergency. Before purchasing a lock, you must measure your doors backset, cross boare and thickness. Cross (or edge) bore: The small hole along the edge of the door frame, usually measuring about 1 inch in diameter. Exterior doors are typically 1 ¾ inches thick, while interior doors measure 1 3/8 inches thick. 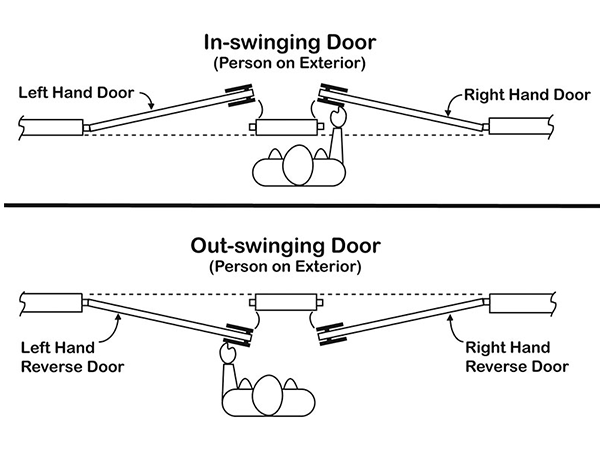 The “handing” of a door describes which way the door swings on its hinges, and thus whether you’d need a right- or left-handing handle or lock. The simplest way to determine the handing of your door is to stand in front of it and push it open. If the door swings in to you, walk to the other side of the door so you are on the exterior and can push it open to perform this test. If the door hinges are on the left and it swings open to the left, you will need a left-handed handle for the exterior side and a right-handed handle of the interior side. If the door hinges on on the right and it swings open to the right, you will need a right-handed handle on the exterior side and a left-handed handle on the interior side. If you have a difficult time recalling the proper handing of your door, simply opt for a door lock labeled reversible handing, which means the lock can be installed on either side of the door. Got Questions About This Product?